I know I'm behind a bit on news, but I recently heard that Joe Sobran died. Back when I was working for a "big aerospace giant," I had a kindly boss. Kindly might not be a good word for an ex-Vietnam chopper pilot who survived two tours, more like tough on the outside and jagged around the edges. But, for the short time I worked with him, he was like my father - the father who was half the country away from me and whom I missed dearly. The father who swore more in one sentence than I could in a lifetime and whose protective arm I could always feel. My boss and my father had many things in common, more than just their bearing and confidence; they both read the Wanderer. I can't say I followed Joe Sobran's column, but his death makes me sad since it makes me wonder about my old boss, thoughts that are quickly followed by remembrances of my father. One thing I learned from my boss was to never complain about my spouse. In jest, I made a joke that was pointed at my husband. I was quickly chastised and told how unbecoming it is no matter what the situation. It's been 20 years, but I still feel that stinging correction. I took it to heart then and still do. So, Don, I hope you're doing well and Garbage Boy is standing on his own two feet and Dish Girl is happily married. 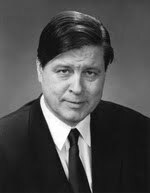 And, rest in peace, Mr. Sobran, you will be missed.